I picked up a bottle of Hop Happy IPA by MKE Brewing Company at Badger Spirits in Beloit WI as part of a “Pick Your Own Six Pack” one off. I was pleasantly surprised. I cracked open the bottle and took a tentative sniff. I was greeted by a floral, grassy hop aroma that seemed to carry just a hint of citrus. I poured it slowly into my favorite tulip glass and and the aroma that had peeked out from the bottle was far more intense in the glass. Hop Happy IPA looks like honey in your glass. It has a white foamy head that hangs around for a few minutes before vanishing completely. I was a little bit bewildered when my first sip of Hop Happy IPA was sweet, but then the hops swept in and completely took over. The hops seem to have far more of a citrus to them at this point…ever so slightly grapefruit. Really quite delicious. A nice bitter aftertaste lingers at the back of your throat…begging you to take another sip. 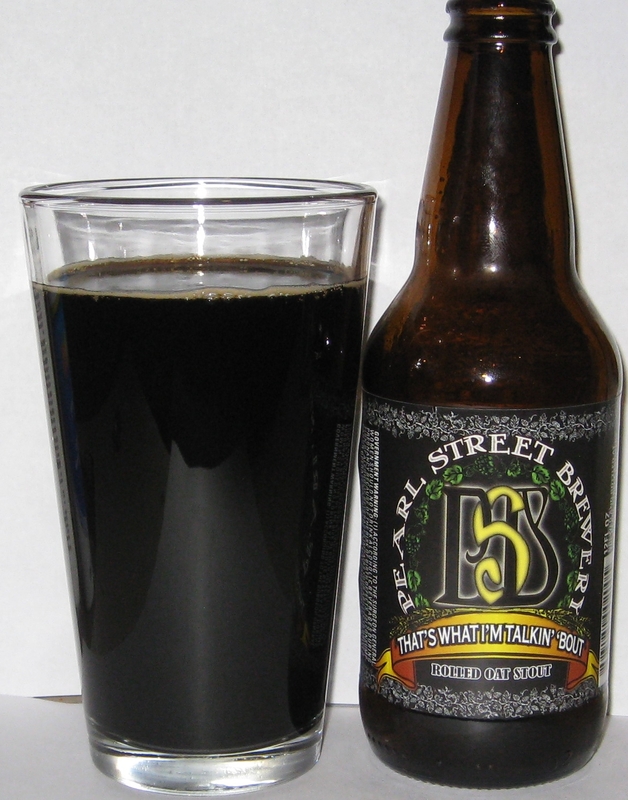 I tend to lean toward IPA’s and Stouts, so I may be a bit biased…on these two styles. I thoroughly enjoyed Hop Happy IPA. Its definitely one I plan to tell my dad and all my friends about. It might be a bit on the boozy side at 7.7%…not something you could drink all night long, but it would be a great beer to take one or two pints of just to get the night started off right. Have you had this before? What did you think? This is quite a tasty beer in my opinion. I’d definitely buy this one again…probably a six pack or two of it next though. Hey…I just want to mention that I tried Dark Horse’s “Smells Like a Safety Meeting” IPA a couple days ago…the day before the 4th of July I think. 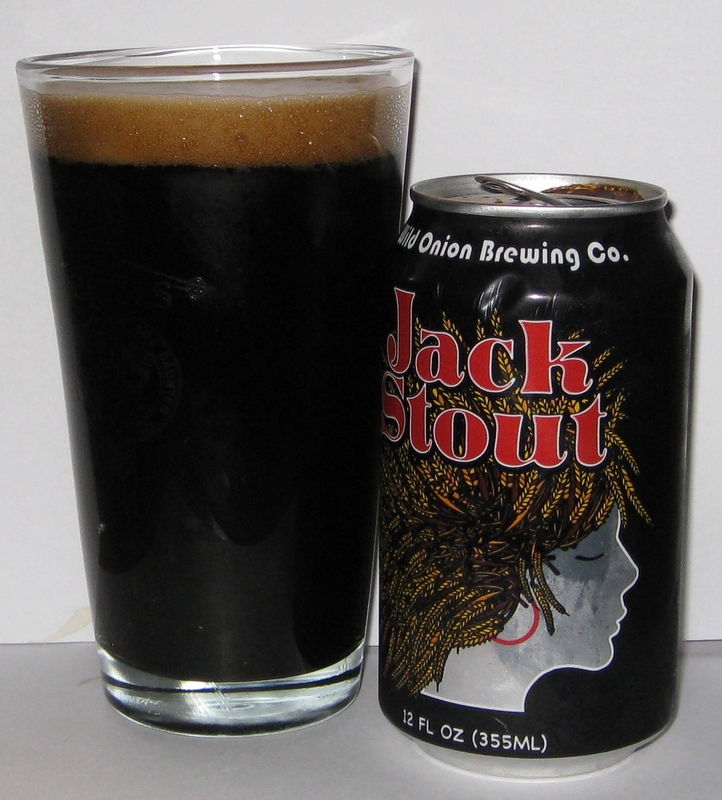 Anyway, I don’t have all the specs right now…and I’d like to pick up a couple bottles to give it a fair review…but I really enjoyed it the other day at Oasis Micro Pub…really good stuff. Hey there…I’m back for more beer related shenanigans. Today we’re going to have a look into the pitch black depths of Pearl Street Brewery’s “That’s What I’m Talkin’ ‘Bout” Rolled Oat Stout. TWITB appears pitch black in my pint glass. Seriously, it looks like someone poured a glassful of the thickest, blackest molasses they could find. There’s a slight tan head, but that disappears pretty quickly leaving just a bit of foam at the top. The aroma is pretty amazing. All the roasted malt punches you right in the nose. Seems like a bit of chocolate comes through as well. TWITB is thick and rich. It’s chocolatey with the slightest hint of coffee. Just as the malt flavors are fading away, a pleasant bitterness sneaks in the back way to take its place. Don’t just sit there…run out and grab some now. By the way…if any of you are tired of reading about Wisconsin and midwestern micro’s, send me something else. If you have a great microbrew in your town and you want people to know about it…send me one…I’ll happily taste and review anything you send my way. Drop me a line at jfrank2264@gmail.com and I’ll set you up with some mailing info. 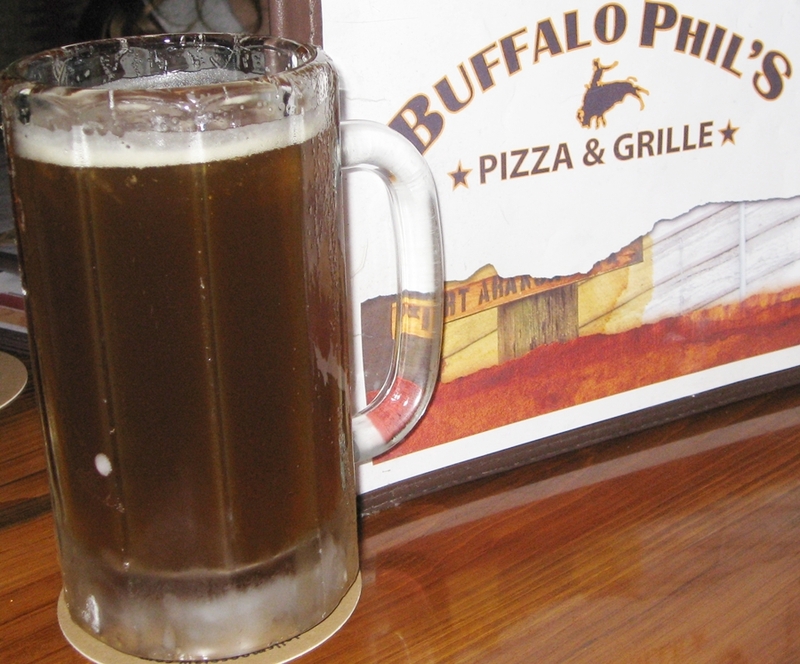 When visiting the Wisconsin Dells, you’ll find Wisconsin Brewing Company’s Kilbourn Hop Ale on draft at both the Moosejaw Restaurant & Brewery and Buffalo Phil’s. This particular day we were having lunch at Buffalo Phil’s. My Kilbourn Hop Ale arrived in a frosted mug. It is golden or possibly bronze in color. It has no real head to speak of, just a slight film floating at the top of the glass. Kilbourn has a piney hop aroma mingled with a slight sweetness. The first sip is all malt and the hop flavor is vague and hard to define. The ale has a clean finish with no lingering aftertaste. Kilbourn Hop Ale is a decent beer , not great by any means, but certainly the high point of a pretty lackluster line up. I wish I had more to say about this one. It’s really just not a noteworthy beer. Kilbourn Hop Ale is an American Pale Ale that is average at best, made by a brewery that is lucky enough to be the only microbrewery in the Wisconsin Dells. Ok…it’s been a few months but I’m back and am going to try really really hard to do better with keeping this up. Excuses, excuses…mainly, my wife and I have been doing Weight Watchers since last March or April. We’ve both been quite successful, but until recently beer had sort of fallen off my radar as I was assuming if I wanted to be able to eat dinner in the evening, beer had to be back burnered…crappy, huh. Well…I have returned to you a much wiser man. I have added running to my exercise routine and in the process, have learned that as long as I exercise I can drink a beer or two a day if I want and still lose weight. Pretty damned cool if you ask me. So anyway, I’m sorry for the long break…won’t happen again. Arcadia Ales Hopmouth Double IPA is certainly a pretty beer. It is an amber colored ale that seems to glow in my glass. A white head quickly forms, but is gone just as quickly. My nose is greeted by an intense citrus hop aroma mingled with a sweetness that reminds me a bit of honey. The first sip is amazing. Hopmouth is crisp with a nice effervescence. The first flavor to hit is the hop bitterness. A fantastic blend of citrus and what seems to be pine. 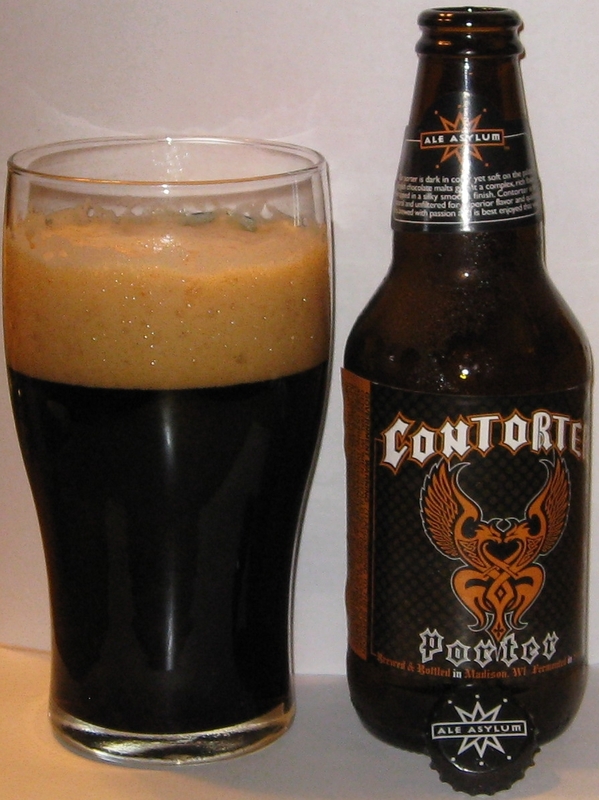 There is also the slightest hint of malty sweetness, but the wonderful hoppiness is far and away the dominant flavor. 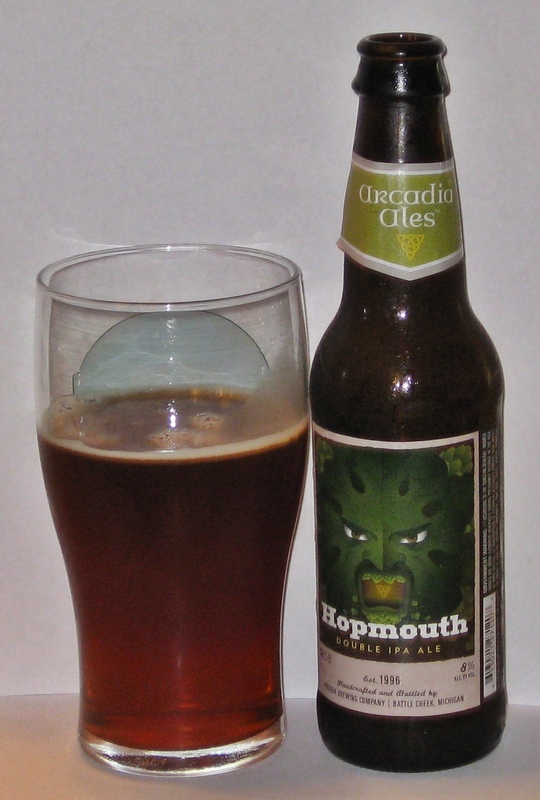 I find Hopmouth to be crisp and really quite refreshing. For me, this seems like the perfect beer to end a day spent on yardwork. I plan to trackdown many more Hopmouth Double IPA’s. I’ve got one bottle left and I’m planning to give that one to my dad. He’s just gotta try this one…and so do YOU.